Shaw Archives · Stop the Cap! Canadians are demanding a better deal from their cable and phone companies and they are forced to respond. As the United States battles back against the introduction of usage caps and rising prices for broadband service, increased competition and regulated open wholesale access to some of Canada’s largest broadband providers have given Canadians an advantage in forcing providers to cut prices and improve service. Canadians can now easily get unlimited broadband access from one of several independent ISPs that piggyback service on cable and phone networks. Some large ISPs have even introduced all-you-can eat broadband options for customers long-capped by the handful of big players. As customers consider switching providers, cable and phone companies have been forced to cut prices, especially for their best customers. Even cell service is now up for negotiation. The more services a customer bundles with their provider, the bigger the discount they can negotiate, say analysts who track customer retention. 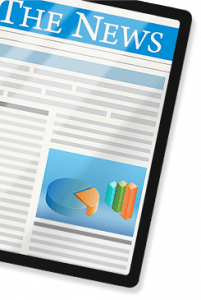 Bell, Rogers, Telus, and others have a major interest keeping your business, even if it means reducing your price. “It’s far more lucrative for the telecom company to keep you there for the third or fourth service,” telecom analyst Troy Crandall told AP. 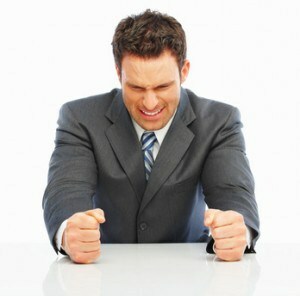 It cuts down on marketing, service and installation calls, he added. Getting the best deal often depends on your services, payment history, and how long you have been a customer. Cellphone discounts are the hardest to win, but customers are getting them if they have been loyal, carry a large balance and almost never pay late. Bigger discounts can be had for television and Internet service — cable television remains immensely profitable in Canada and broadband is cheap to offer, especially in cities. Americans often pay $80 or more for digital cable television packages, Canadians pay an average of $60. Internet service in Canada now averages $45 a month, but many plans include usage caps. It costs more to take to the cap off. Because of Canada’s past usage cap pervasiveness, online video is not as plentiful in Canada as it is in the United States. There has been considerably less cord-cutting in the north. Despite that, Canadians are ravenous online viewers of what they can find to watch (either legally or otherwise). As usage allowances disappear or become more generous, online video and the Internet will continue to grow in importance for service providers. Customers should negotiate with their provider for a better deal, particularly if Bell’s Fibe TV is in town. Bell has been among the most aggressive in price cutting its fiber to the neighborhood television service for new customers ready to say goodbye to Rogers or Vidéotron. 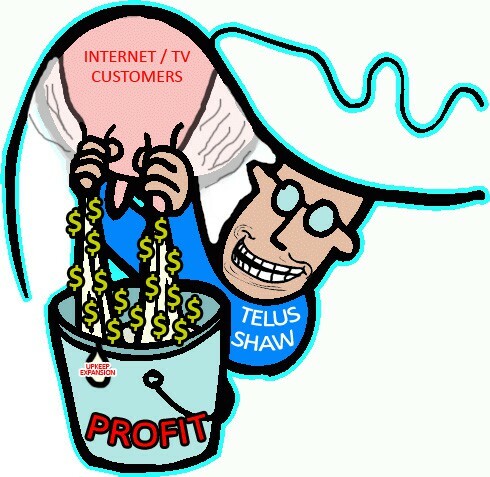 Shaw and Telus battle for market share in the west and also have room to cut customer bills and still make a handsome profit. When Jeff McDonaghe celebrated the beginning of 2013, his cable and Internet bill from Shaw Communications was roughly $117 a month. In April, Shaw announced a wide-ranging rate increase that cost the Calgary resident an extra $7 a month. Now Shaw is back for more with another rate increase that will cost the McDonaghe family an additional $11 a month. His October bill: nearly $135 — $18 more a month. “Shaw seems to have gotten quite comfortable raising rates at least twice a year, because my bill has gone up like clockwork every six months or so,” McDonaghe tells Stop the Cap! Shaw representatives blamed the “price adjustment” on the cost of programming, its upgraded “digital gateway” set-top box, and higher licensing and regulatory fees. At Shaw, we’re committed to providing quality products and services at the best value for all customers. To continue delivering the best entertainment options, you may notice a few changes to your monthly bill, effective September 1, 2013. For customers in Manitoba and Ontario (excluding Hamilton), these changes will take effect on October 1, 2013. Some of the most significant rate hikes will affect grandfathered service plans, leaving some customers scratching their heads. Shaw’s old 20Mbps plan (no longer listed on the company’s website) now costs $60 a month, the same price charged for Shaw’s newer 25Mbps tier. The company’s old “discount” Internet plan delivered DSL-like speed of 7.5Mbps for $45 a month. On Sept. 1, Shaw raised its price to $50. Today, Shaw’s entry-level 10Mbps broadband package sells for $55 a month — only $5 more — with a 125GB monthly usage cap. Despite the company’s claims of increased costs, Shaw reported $250 million in profits during the third quarter of this year, delivering better than anticipated results with a promise to return some of the excess cash to shareholders in the form of dividends. “Given the improvement in free cash flow and assuming continued favorable market conditions, our board plans to target dividend increases of five to ten percent over the next two years,” said Brad Shaw, CEO of Shaw Communications. Shaw’s financial gains come at the cost of its declining customer base. During the summer, Shaw lost at least 26,578 basic cable subscribers due to increased competition from Telus’ TV service. The company did better adding broadband customers (4,157), but its greatest growth has come from its phone business, where the company picked up 17,719 new landline customers. 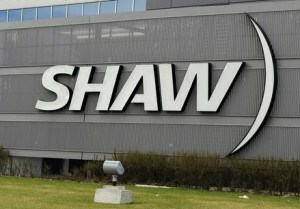 “Shaw’s revenue and EBITDA beat was mostly due to price increases,” added Greg MacDonald, managing director at Macquarie Capital Markets Canada. Bradley Shaw, Jim’s brother and current CEO is eligible for a $3.97 million pension at age 65. His accrued pension obligation is $37.6 million. Jim Shaw’s pension alone has cost Shaw more than $71 million in financing expenses because the company’s executive pension plan is not pre-financed; the costs are instead paid from annual cash flow as a compensation expense. Shaw Communications has acquired Calgary’s largest fiber optic cable network in a $225 million deal with ENMAX Corp. in a bid to strengthen its ability to serve large corporate customers who need more bandwidth than Shaw is now positioned to offer. ENMAX sells its Envision fiber service to large corporate clients in and around downtown Calgary and to those businesses that need dedicated connectivity across multiple offices. The acquisition will further enhance Shaw’s dominance in Calgary. Shaw remains western Canada’s largest cable operator with an emphasis on serving Alberta and British Columbia. Shaw’s business plan, revamped last year, is much closer to American cable operators than Rogers Communications — the dominant cable company in eastern Canada. Shaw abandoned its mobile ambitions and will stay out of the cellular business. In January, Shaw announced its intentions to sell its AWS wireless spectrum holding to Rogers. Shaw has also ended efforts to expand eastward after announcing it would sell Mountain Cablevision, Ltd., which serves parts of Hamilton and the Niagara Region of Ontario, to Rogers. In 2013, Shaw subscribers can expect to see a broadening of the company’s growing Wi-Fi network — available free of charge to its broadband customers, a major upgrade to its DreamGallery set-top box software interface, and the completion of plans to switch its cable television lineup to an all-digital format by the end of this year. Mountain Cablevision was owned by Shaw Communications but has been purchased by Rogers. Rogers Communications, already Canada’s largest mobile-phone company, will grow even larger with the acquisition of Shaw Communications’ unused wireless spectrum and a Shaw-owned cable company making inroads in Rogers’ backyard in southwestern Ontario. Rogers has agreed to pay $300 million for the spectrum and $400 million for Hamilton, Ont.-based Mountain Cablevision, Ltd. In return, Shaw will acquire a one-third interest in Rogers’ TVtropolis network. Shaw is getting a premium price for the wireless spectrum it acquired in 2008 for $190 million. 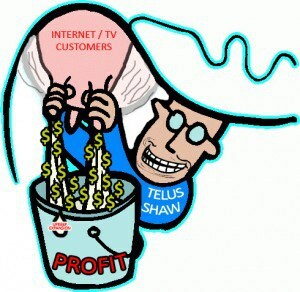 Shaw, like many American cable companies, originally planned to launch competing mobile phone service but aborted the effort in 2011, deciding to invest in its broadband service and construct a Wi-Fi network in western Canada instead. Rogers CEO Nadir Mohamed told Bloomberg News the spectrum is needed to meet growing demands from Canadian wireless broadband customers. Rogers is by no means finished acquiring spectrum. The company plans to borrow as much as $800 million to purchase more at the next Canadian spectrum auction later this year. Shaw Cable, Canada’s dominant broadband provider in the west, has admitted it has stopped enforcing usage caps as the company upgrades its Internet Overcharging scheme. Jim MacDonald, a Stop the Cap! reader, long-standing Shaw customer and member of the company’s “Shaw Friends” program noticed on a recent bill he qualified for “additional Internet usage” by belonging to the company’s loyalty club. “I used Shaw’s concierge chat to learn more about what this means and found I would qualify for an additional 25GB allowance as a Shaw Friend, but the representative didn’t seem to think it was an important distinction,” MacDonald writes. MacDonald: I am wondering how I can get the extra 25GB added to my account as a Shaw Friend. The usage meter does not seem to reflect anything about it. Shaw: We plan to apply that extra usage in the near future. I’m not exactly certain of the date but it should be soon. But no worries, we are not even monitoring the data right now. Once upgrades are complete and when we do monitor, you will have the extra space on your account and visible on the ‘view usage’ screen.